All transactions are safe and secure with a reliable history in online purchasing behind each of our associates. Buy the I Am McLovin Hoodie t-shirt to own Superbad clothing and merchandise. 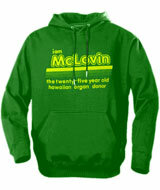 The lime design on this bestselling McLovin hoodie is comprised of a logo featuring the text, "I Am McLovin, the twenty-five year old Hawaiian organ donor." Lime bars underline the text, adding to the hoodie's popular appeal. Wear it over the identical Superbad t-shirt whenever you feel neurotic like Fogell, or if you plan to become a 25-year-old Hawaiian organ donor. Browse through to see the women's version which is equally appealing. In addition to the I Am McLovin Hoodie tee above, browse the Superbad Clothing Gallery for more apparel like men's and women's clothes, kids shirts or hoodies.